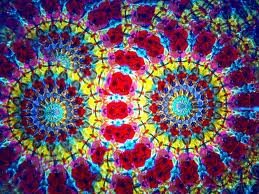 Have you ever looked into a kaleidoscope at the changing shapes and colors? I had one, as a little girl, and loved to turn it slowly and watch the little pieces fall into the different patterns. Looking at clouds is another time that shapes change as you are watching because the wind is blowing up high where you can’t see it except in the changing shapes of the clouds. We start our life journey as an infant with our only shaping force, so far, is our heredity. We are then influenced by the way people treat us, things we see and hear and in my experience sometimes our impressions of events are more real than the actual event. We get to a place in life where everything seems settled, and then the wind of change happens in our life, our shape becomes something we don’t recognize, and we don’t know how to deal with this new shape we are given. We adjust, the wind continues to blow and we see something different. There are times we bring about the change because we become unhappy with our present situation, so we blow along with the wind like a balloon bouncing along in a current of ever changing wind. I have watched people through the years that have faced adversity and came out shining like a diamond, changed but much better for it. Others have crumbled under situations less arduous. Strength in the midst of a storm is something I greatly admire, a person who can “take a licking and keep on ticking”. I am on the inside of a family that has had it’s share of trouble, but we are still standing, thanks to our God, who has never left us, nor forsaken us. All of us are in crisis situations of one kind or another. Some are facing financial ruin, others relationship troubles and family problems. I have two close friends that are each in a health crisis, others that have lost close friends due to misunderstandings. What can make us all better, whole, healed, and able to face tomorrow? Jesus fed thousands of people with five loaves of bread and two fishes; He also turned water into wine. The Children of Israel were fed manna, had water given to them from a rock, they had shade by day and fire by night. Philippians 4:11-13 the Apostle gives us some excellent advice: I don’t have a sense of needing anything personally. I’ve learned by now to be quite content whatever my circumstances. I’m just as happy with little as with much, with much as with little. I’ve found the recipe for being happy whether full or hungry, hands full or hands empty. Whatever I have, wherever I am, I can make it through anything in the One who makes me who I am. Verse 19-20 You can be sure that God will take care of everything you need, his generosity exceeding even yours in the glory that pours from Jesus. Our God and Father abound in glory that just pours out into eternity. Yes. Whatever is wrong, anchor yourself to the Rock and sing with joy to Him in thankfulness for saving you out of your troubles. Psalm 95:1 Come; let us shout aloud to the Rock of our salvation. Hebrews 13:8 There should be a consistency that runs through us all. For Jesus doesn’t change—yesterday, today, tomorrow, he’s always totally himself. One night during a Bible study, a terrible storm hit, but by the time we started leaving the church, the storm had calmed and the sun was shining through the clouds once again. The storm left as soon as it had come leaving a small path of devastation in its path! As I looked at the mess, I thought about how you can’t change the direction of the wind; just let Jesus adjust your sails to get you through the storms of this life! You don’t have to be afraid; He can calm the storm on the sea, or in your life, with one word, Peace! Wow Mama H! I thank you for these words. This was just what I needed right now. Like you said, we all go through things, and there is ALWAYS something. You get through one thing and you think you’re sailing on smooth waters, then lo and behold, the wind shifts again! I, too, live in a family who have had our share of adversity. From a young age I have experienced some pretty awful things, but I’ve always been able to stay strong and make it through. I always say, go with the flow and pray about it! I thank you for the scriptures and I love you! !